The calculator below allows you to get your McAuley Index, a valuable surrogate measure of insulin resistance, and assess your likelihood of having IR. Type in your fasting insulin and triglycerides and find out were you are in terms of risk of insulin resistance, using the interactive model below. Why use calculation based on McAuley et al. ? 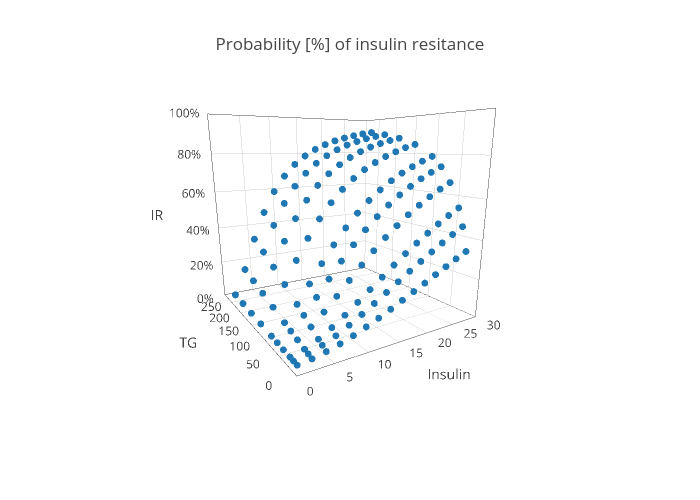 It allows you to calculate your risk of insulin resistance with just 2 parameters and with basically the same predictive value as more complex measurements (glucose challenge with insulin at every point). For more details about its predictive value please see a recent paper by Abbasi et al., which compares various methods of assessing IR risk. My short post about it also summarises the available information. For interesting discussion on various predictors of insulin resistance please listen to the BreakNutrition podcast Episode 34. Is it possible to use the McAuley index with C-peptide? In the Netherlands we tend to test this more often then fasting Insuline? Converting the units is done by either “/18” or by “*18” depending from where to where you convert (mg/dl mmol/l). When I calculate the “Score 2B … in McAuley’s Paper) … I get different values … incl. appropriate propabilities. Thank you for the comment. Conversion by a factor of 18 to go from mg/dL to mmol/L (SI units used in the McAuley equation) would be valid only for glucose (or other molecules with a molar mass of 180g/mol), not triglycerides (molar mass ~885g/mol – taken as triolein, hence the conversion factor of 0.0113 = (1mg/dL)/(885mg/mmol)*10dL/L ).